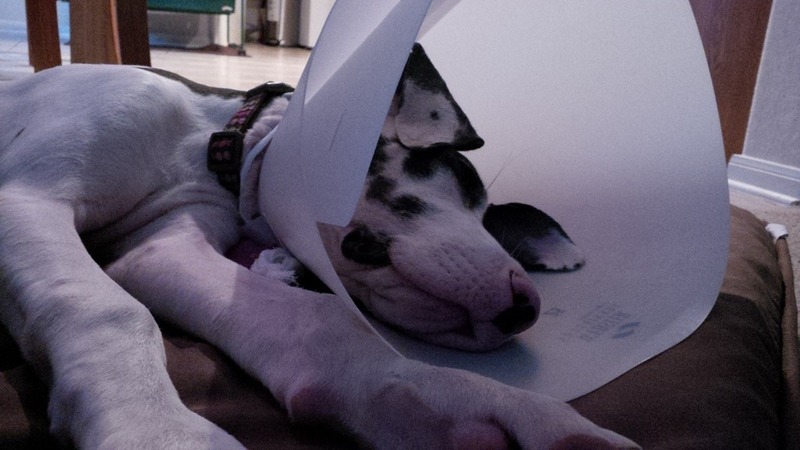 So we got spayed and lost our mind. Well, let me back up a few steps. I took her in that morning, which was kinda nice hanging out and having coffee with a somewhat sleepy dog in the back seat. She was all cuddly and nice. Got into the vet and dropped her off. That little pit of my stomach feeling aching that I didn’t have to have all this stuff done and hoped that she’d be okay. I arrived that evening, and there was my baby. All “gorked” (the vet’s word!) up and just droopier than ever. Took her home and we all watched movies while she just sorta sighed and shifted around a 10-inch scar. It looked painful. So with help, carried up the stairs and passed out a full night of sleep again. In the morning, she was carried back downstairs and fed. She ate a little and wobbled about the house. Then Sunday came. She was a little better, even a little more cheeky knowing she was obviously getting special treatment. Then Monday. HOLY LORD. Now she knows EXACTLY what cream cheese is, because I’m wrapping pills in it. Her nose immediately hits the air as if she’s on a hunt. There go my peaceful coffee and bagel days – she has a favorite food now. and apparently, there’s just NO pain – jumping. LOTS of it. Like twice as high as normal. Up the stairs DOWWWWNNNN the stairs, sideways on the stairs. GO GO GO! Kill! Eat! Jump! June bugs see their imminent death! Benadryl. Sleep. ZZZZZZ. amen. I don’t know how to feel about sedating a dog just because they are jumpy, but those staples scared me, a lot, and I wasn’t about to have her breaking them. Finally she’s starting to calm down, but we’re nearly a week later. She’s taking on bad habits too. We’ve had accidents inside, she jumps at treats, she isn’t as “good”. Where is my lumpy dog? The melty ice-cream cone puppy I love? Where? Hopefully post-staple-removal on Friday, which coincides with “cone removal”, I will get back my little ungraceful four legged giant. I hope. 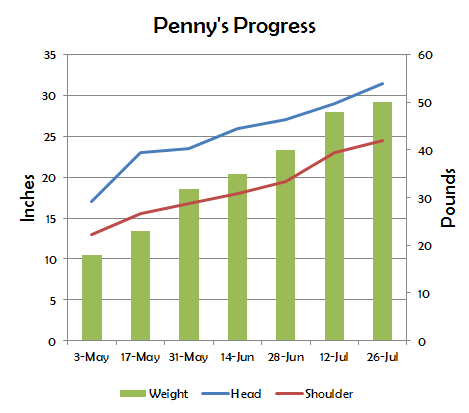 That said, I’ve gotten good readings on her weight since the vet visits went in line with our normal weigh ins. Despite smaller meals due to the surgery, apparently the “schmear” obsession took it’s toll on her tipping the scale!